1. Street food is relegated to dirty water dogs, halal food, smoothie carts, and the like. 2. Newartisanfood truckspop up as a way to serve high quality product with lower start-up costs. 4. Inevitable clashes between old vendors and "hipster" vendors. 5. Inevitable clashes between brick and mortarshops and food trucks. 6. Blogs, desperate for content, mindlessly champion any new truck that comes along. 7. Courteney Coxplans food truck related sitcom. 8. 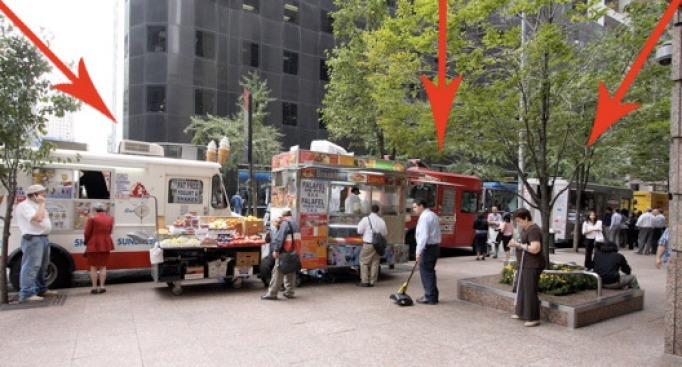 Media corporations use food trucks for publicitystunts. 9. So do major liquor and foodbrands. 10. Artisan food trucks gobrick and mortar. 11. Food truck owner awarded honors by majormagazines. 12. BLT Restaurant Group launches burger truck this Saturday.